I purchased a PlayStation 4 and an extra DualShock 4 controller for two-player games. I rarely use the second controller and wondered if I could use it to play games on my Mac. You can, though with some games you’ll need extra help. Before we get to that let’s start with the hardware configuration. As you know, the DualShock 4 controller has a micro USB port on the back, just below the status light. You use this port to initially pair the controller with the PS4. But it can also operate as a link between the controller and your Mac. Just string a USB cable between the two and the controller is ready to use. But, in some cases, you don’t need the wire. The DualShock 4 performs its wireless magic via Bluetooth so, in some instances, you can control your Mac games from across the room. To set up the controller for Bluetooth use, detach the USB cable, launch System Preferences, select the Bluetooth preference, make sure Bluetooth is switched on, and then press and hold the PlayStation and Share buttons on the controller until its status light blinks rapidly. The DualShock should then appear in the list of devices as Wireless Controller. Just click Pair and you’re connected. Note, however, that not all games support a wireless connection. 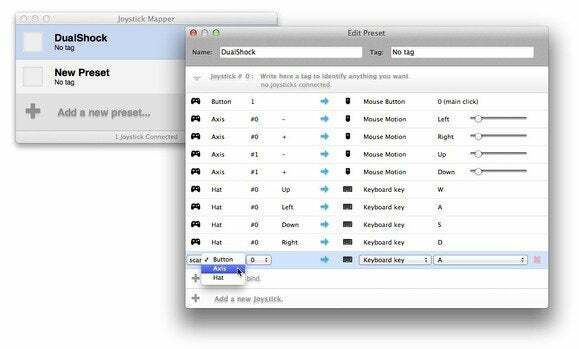 You can pair your DualShock controller with a Mac via Bluetooth. Speaking of which, a word about compatibility. With some games, the connected controller will work from the get-go. For example, Feral Interactive’s Rayman Origins works perfectly with the controller without you having to do a thing. Other games, however, work a little bit or not at all. For instance, with Valve’s Portal and Portal 2 (available via Steam) you can’t use the controller to move around or look up or down, even though Steam itself recognizes the controller and lets you assign functions to it. And Aspyr’s Doom 3 is entirely unaware of a connected DualShock. So it’s really a matter of the original developer making their game compatible with these kinds of controllers. Because you could wait a long time for this to happen (in some cases, forever) you should consider taking matters into your own hands by using a third-party controller utility. One such utility is Chibata Creations’ $5 Joystick Mapper. With it you assign functions to the controller’s joystick or buttons. These generally come in the form of mouse movements or keystrokes. For example, you might assign the Mac’s W key to the forward motion of the left joystick and the Fire function to the controller’s O button. According to the developer's notes, wireless control from a DualShock 4 is not yet supported. If a game doesn't natively support your controller, use a tool such as Joystick Mapper to get the job done. Another option is OrderedBytes’ $25 ControllerMate. This is a far more sophisticated utility that allows you to create triggered actions by stringing together building blocks. If you want to go beyond the basics with your controller, it’s worth your while to download the demo and run through the tutorial to see just how powerful it can be. The upshot is, yes, you can use a controller like this with your Mac. If you’re an enthusiastic console gamer more comfortable using a controller than a keyboard or mouse it’s something I’d urge you to try.